We investigated genetic and environmental influences common to adolescent externalizing behavior (at age 12), smoking (at age 14) and initiation of drug use (at age 17) using the FinnTwin12 cohort data. Multivariate Cholesky models were fit to data from 737 monozygotic and 722 dizygotic twin pairs. Heritability of externalizing behavior was 56%, that of smoking initiation/amount 20/32%, and initiation of drug use 27%. In the best-fitting model common environmental influences explained most of the covariance between externalizing behavior and smoking initiation (69%) and amount (77%). Covariance between smoking initiation/amount and drug use was due to additive genetic (42/22%) and common environmental (58/78%) influences. 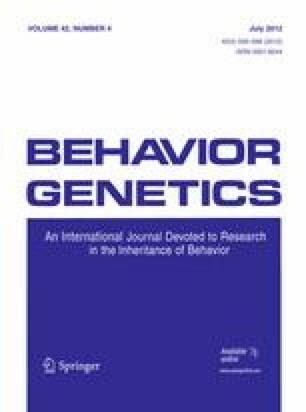 Half of the covariance between externalizing behavior and drug use was due to shared genetic and half due to the environments shared by co-twins. Using a longitudinal, prospective design, our results indicate that early observed externalizing behavior provides significant underlying genetic and environmental influences common to later substance use, here manifested as initiation of drug use in late adolescence. The Academy of Finland research program on substance use and addictions (118555); the Academy of Finland (100499; 205585; 141054); the Academy of Finland Center of Excellence in Complex Disease Genetics (213506, 129680); the National Institutes of Alcohol Abuse & Alcoholism (NIAAA), USA (AA-12502; AA-09203; AA-00145; AA-15416); and the NWO—Vidi scheme, Netherlands (452-06-004). The authors would like to thank Dr. Hermine Maes for her advice in Mx modeling.